Unfortunately, Mochi is game over. So for now you cannot get any new high scores or medals. We're working on a new high score system for Big Fun Town and once available, you'll be able to get high scores and medals again. We're keeping your existing high scores and medals for posteriority. If you're good enough at a high score game, you'll be awarded a Gold (1st), Silver (2nd), or Bronze (3rd) Medal. Your profile summarizes the total number of each medal you currently hold. You can only win medals on games in the "High Score" category. You only compete against other registered Big Fun Town users (guest scores are ignored). If another member beats your score, you'll lose a medal, but you can win it back by beating their score. Your overall score measures your overall level of achievement at the high score games. 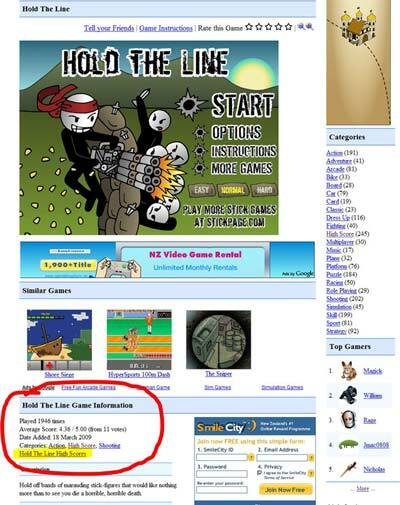 You gain points by getting high scores on games in the "High Score" category. You gain points for medals (3 for Gold, 2 for Silver, and 1 for Bronze). You also gain upto 1 point for every high score, based on how close your score is to the top score. When games have multiple modes and multiple high score tables, you can get high scores, medals, and points in each mode. Please register and log-in to track what games you've played.